Our fun activity today was easy, very tidy and still time-consuming for the kids! Today I had a two-year-old who needed some extra attention. Calista yearned for something to do while her sisters played more sophisticated games with their little people, so I started looking around for a quick and easy activity that would interest her. After I opened our package today (we upgraded to a “real” microphone for Skyping — the Yeti), I had turned over the blocks of polystyrene that had protected the device and wondered what they could be used for. Surely, with creative minds in the house, these polystyrene bricks could have new life breathed into them. So I did a quick Google search and couldn’t find anything satisfactory. I didn’t want to buy any more craft supplies, and my primary concern was that the girls didn’t start breaking up the bricks, leaving bits everywhere for the baby to eat. But then I thought about the successes I’d had with offering my sewing stash to the girls to play with, plus Aisha’s current fascination with sewing. So I brought out my pearl-headed pins and matched it with one of the polystyrene packaging blocks and gave them to Calista. I showed her how to poke the pins into the block, and as she got started, we were soon seriously looking at the colour of each pin. Calista's preference was for the pink and purple shades, and she alternated between pulling them out of my make-shift pin-cushion (a teddy), putting them into the polystyrene block and then putting them all back into the teddy. 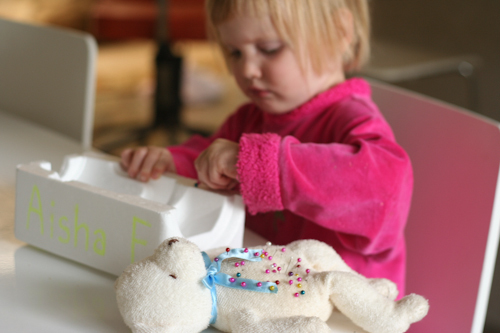 For the toddler, this activity encourages development of fine motor skills and colour identification. Later on, when Calista had announced that she had had enough (after first teasing her sisters by hopping down and then back up again several times), it was Aisha’s and Brioni’s turns. 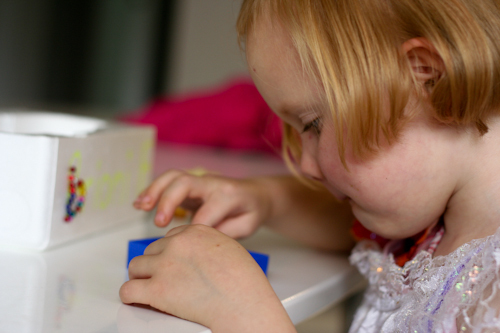 I drew their names on the polystyrene blocks and encouraged them to follow the outlines of the letters. 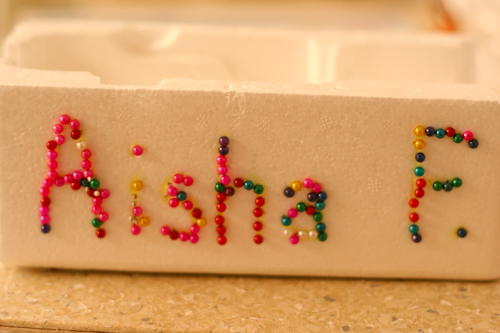 Aisha started out by tracing the letters of her name. Brioni worked on her own name too. 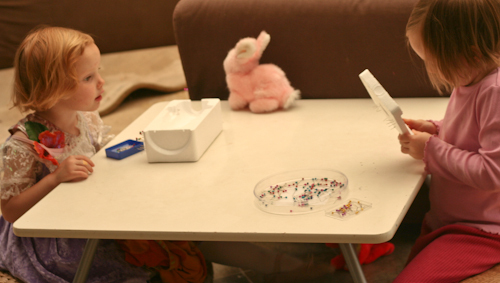 As they sat opposite each other at the table, the girls worked on their own projects. They were soon talking about each pin, swapping colours, discussing the merits of each and somehow determining that certain pins were "special". I’m always amazed at how Aisha and Brioni can carry on lengthy conversations while they’re playing. They’re two old souls, chatting like old biddies — reliving conversations, analysing actions and emotions, disagreeing and then reaching a consensus. Brioni is fiery and emotional, and Aisha is logical and rational. The two clash mightily but smooth things over very quickly. Isn’t that how all good friendships should be? What a great idea! I will have to invest in some more pins to try this. My daughter is completely engrossed in sewing right now. I am trying to teach her to put the needles away so her siblings don’t get them! 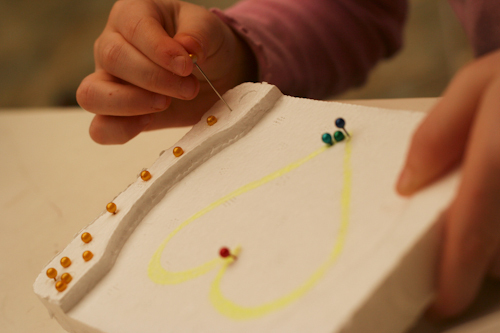 This would be a wonderful activity for my other children to do while she sews at the table. Our quick, keep them busy activity is filling half a bowl with water and put in some dish soap. Give them a straw and this can last forever! lol You mentioned to me about linking again and I am not sure what you meant. I am not very computer savvy. ;) What beautiful pictures you have here! Have you ever considered making your blog into a book. I have seen that done and it is amazing! I’ll say it again – I just love how you are so tuned into your kids’ development, different personalities, etc. 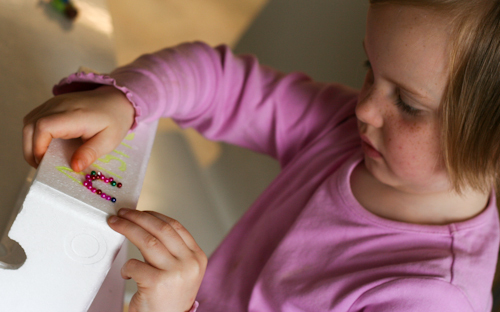 wow, that is a cool activity with styrofoam / polystyrene! I also save our styrofoam pieces, (dd hasn’t used them in a while) but she used to make things with pipe cleaners attached to them etc. Fun! I’m impressed with the fact that you gave your girls the responsibility of playing with the pins even though there is a small element of risk that they would poke themselves, each other etc… They obviously rose to the challenge. Our kids learn so much more when we allow them to take a risk. Thanks for reminding me of that Lauren. LOVE this idea, thank you for sharing! Peta, everything has an element of risk — even colouring-in! Perhaps I am happier with a greater level of risks than more parents, and my children are also more responsible as a result. This is a great activity! We often do Push pin work, but I have never tried this! Thanks so much for sharing and linking up! What a good idea! I remember my eldest used to put the pins into a chair cushion. My little one hasn’t seen as much sewing because I find it harder with two, but the big one would love to do it again now she’s old enough to make patterns and things. This is absolutely fabulous! I’m so impressed. Poor teddy though lol. My daughter would love this activity. Will be trying this one. Thank you! What a fabulous idea! 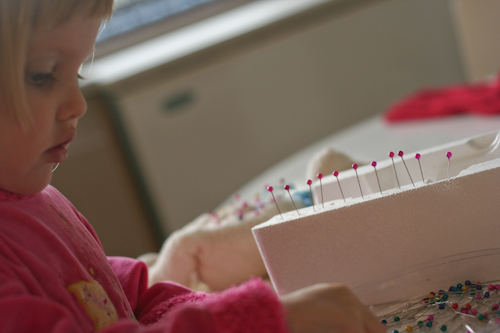 My three year old loves to sit and put pins from one pin cushion to another while I sew… I had never thought of a lump of foam for this, so much fun! They did such a wonderful job. This looks like it could be hard.